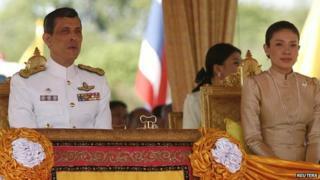 The wife of Thailand's Crown Prince Vajiralongkorn, Srirasmi, has resigned her royal position, the palace has announced. A statement said King Bhumibol Adulyadej had accepted Princess Srirasmi's written request. Crown Prince Vajiralongkorn had asked the government to strip his wife's family of their royally bestowed name. Seven of her relatives had been arrested in a purge of officials allegedly involved in corruption. The palace statement, which appeared in the Royal Gazette, read: "Princess Srirasmi, wife of Crown Prince Maha Vajiralongkorn... has written to respectfully resign from her status in the royal family and permission has been granted by His Majesty the King." Srirasmi is the crown prince's third wife, and the pair married in 2001. They have a son. He was already known to be estranged from the princess, although they continued to attend official functions together. There has been no official announcement of a divorce, but their separation is being seen as inevitable. The princess's uncle, a police general, was arrested over accusations of amassing vast wealth through smuggling and gambling rackets. Srirasmi would have been expected to become queen when the crown prince succeeded his father. This is not the first time a wife of the crown prince has been brought down in this very public way; his second wife was also discredited, then forced into exile 18 years ago. The world's longest-reigning monarch, King Bhumibol, a widely revered and unifying figure, has been on the throne in Thailand since 1946. The pivotal position of the monarchy in Thailand's political order makes the succession an extremely sensitive issue. Many aspects still cannot be reported from inside the country. The strict lese majeste law criminalises any critical comment about the monarchy.